The Boxster boasts classic Porsche design and engineering in a relatively budget package. This model from the famous luxury brand swept away the competition, but Porsche were under no illusions. To stay at the front of the pack, you have to evolve, so 2004 saw the arrival of the next generation Boxster. This new model featured sharper styling, slightly higher power outputs and further changes in 2006 brought engine revisions. Overall, it’s an extremely stylish and powerful vehicle that can be picked up at a fraction of the price from the range of used Porsche Boxsters for sale at RAC Cars. The Porsche Boxter was created using the traditional design language of the brand. Interior quality went from very good to luxury with the upgrades, but whichever used Porsche Boxster you go for, this is still a car with all the attendant majesty that word conveys. The hood is state-of-the-art, taking 12 seconds to convert with single button operation and a simple lead latch and the boot is surprisingly roomy. With its great looks, the Boxster is an ideal car for urban posing and is capable of so much more. Second generation used Boxster models benefited from a glass rear windscreen panel over the original's plastic version, plus a new glove compartment and slicker front end, while in 2009, the dashboard was tidied up by the advent of a touchscreen interface replacing the buttons controlling most functions. 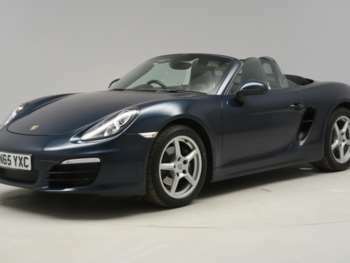 Used Porsche Boxsters are not all about the looks, it is a reliable and practical car too. The controls are comfortable and rewarding and the car handles like a dream. Even the entry-level model gives a rewarding performance, at 6.6 seconds from 0-60mph and a 155mph top speed in the post-1999 models, while the S will take you to 60mph in sub-6 seconds. There's none of the shake, rattle and roll you might expect from a convertible and the whole thing is beautifully controlled no matter what you throw it at, thanks to a comprehensive stability control management system. No rivals even come close. Got a specific Porsche Boxster model in mind?